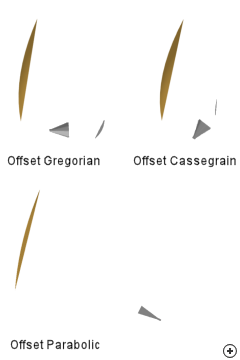 Image of the Offset-fed Cassegrain reflector antenna. 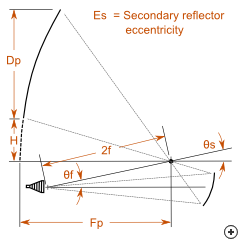 Dual-reflector antennas are based on principles that have been used in optical telescopes for centuries, with Cassegrain and Gregorian telescopes dating back to the late sixteen hundreds. These antennas share many of the underlying principles of operation with typical single-reflector structures. 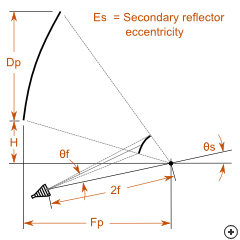 They employ dual reflection to achieve compact structures by allowing the position of the feed antenna to be mirrored around the focus point of the added sub-reflector. Side view of the Horn-fed Offset Cassegrain construction. Side view of the Horn-fed Offset Gregorian construction. 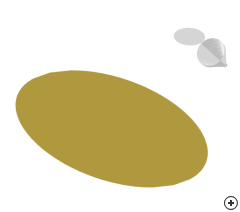 Offset dual-reflectors also have a number of advantages when compared to their asymmetrical counterparts. 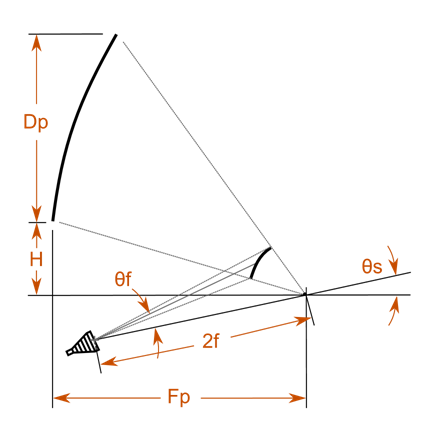 By moving the feed to an offset position, aperture blockage can be minimised (as illustrated in the previous illustrations) and fewer/smaller struts are required to support the feed and sub-reflector. 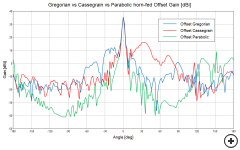 The following image shows a comparison between three different offset reflectors - an offset Gregorian, an offset Cassegrain and a single reflector with an offset pyramidal horn feed - all designed for 35 dBi gain and a 35o 10dB feed-beamwidth. 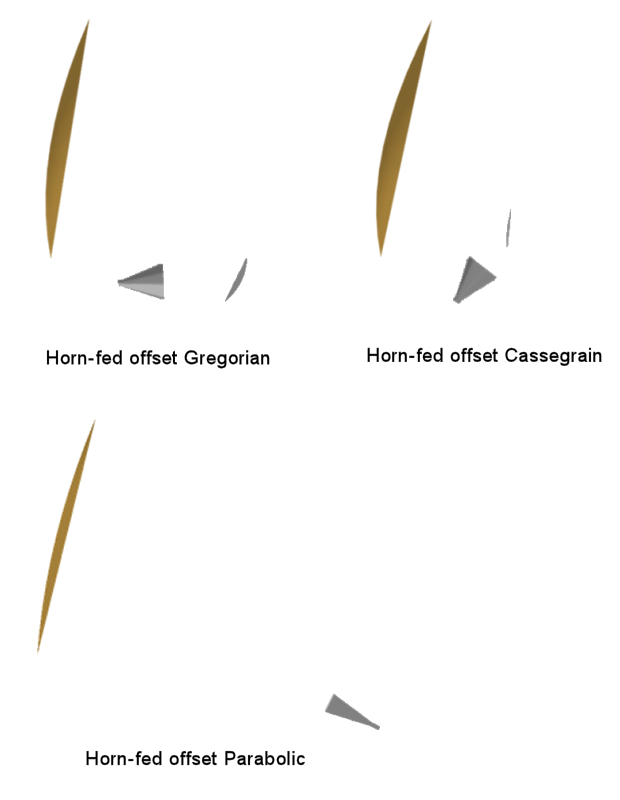 Offset-fed Cassegrain and Gregorian reflectors have the advantage that the main reflector and the horn feed can be designed almost independently. Although this requires that various additional factors be considered in the design process, the dual-reflector structures are more compact and offer more design freedom. 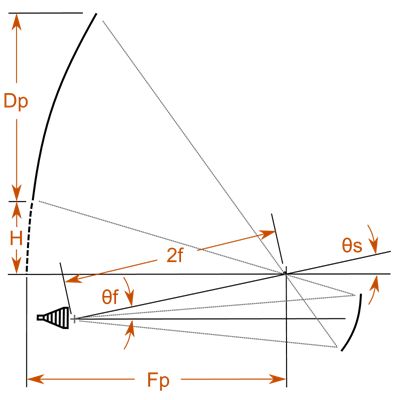 Size: The Cassegrain's sub-reflector is positioned slightly closer to the main reflector, making it more compact than the Gregorian in the horizontal direction. The feed on the other hand is positioned further away from the main and sub-reflectors making it less compact in the vertical direction. 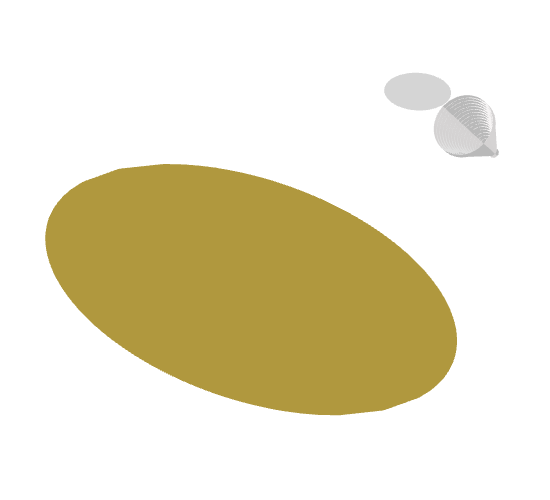 Spillover: requirements: The feed of the Gregorian illuminates the sub-reflector at a greater incidence angle than that of the offset Cassegrain, providing more feed beamwidth flexibility and the potential to better control spill-over. The next graph shows a comparison between the radiation patterns of the three reflector designs displayed in the image on the previous page. Note the Cassegrain's higher first sidelobe level due to unwanted spill over from the horn feed. One can compensate for this by changing the orientation and position of the feed and sub-reflector. This would however introduce unwanted blockage which has to be compensated for by enlarging the main reflector. 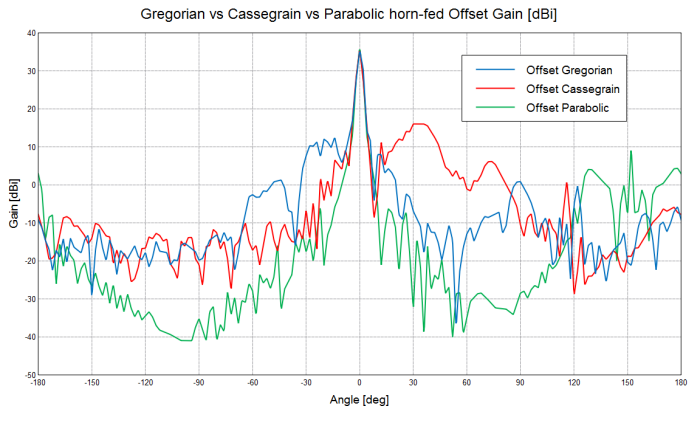 Gregorian vs Cassegrain vs Parabolic offset-fed reflector gain comparison.